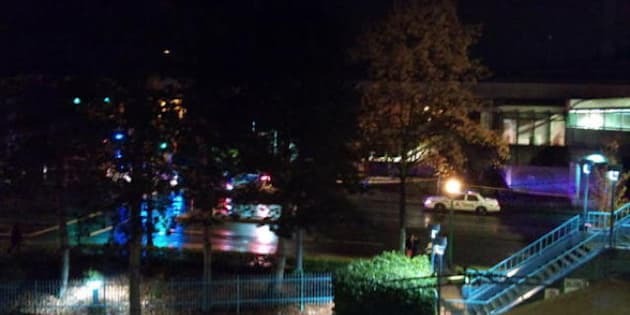 UPDATE: Nov. 3, 2012: Investigators confirmed Friday night that the second suspicious package was not an explosive device. A second possible explosive device shut down the SkyTrain service at Metrotown Station in Burnaby on Friday night, hours after a bomb was found on an elevated track in Surrey. The discovery of the first bomb - between the Gateway and Scott Rd. stations at 2:15 p.m. -- triggered a high-alert sweep of the SkyTrain system. During that inspection, a TransLink staffer found the second device, reported The Vancouver Sun. Until the RCMP bomb disposal unit has dealt with the scene, the SkyTrain is not stopping at Metrotown. However, the bus loop is still open. Transit Police spokeswoman Anne Drennan told the newspaper the second device does not look like the bomb that was confirmed in Surrey. On Friday afternoon, a passenger spotted a red canister on the Surrey SkyTrain track and reported it to TransLink, said The Province. The device was made of cylinders that looked like small propane tanks with straps and wires sticking out of it, said the newspaper. The device was removed, dismantled and later exploded by an RCMP bomb squad. Video shot by CBC News from a tree showed a bomb disposal officer placing an object into a bag. Drennan told media that investigators are going through surveillance video to determine how the device got onto the tracks and how long it had been there. Police are asking people who may have seen someone climbing the tracks or throwing an object up onto the line to call them. The first bomb scare stopped trains running between Scott Road and Gateway stations for about three hours on Friday afternoon. TransLink has beefed up security with extra uniformed transit police officers as well as plain clothes transit police detectives, said Drennan.